(Nanowerk News) High performance materials for gas storage, thermal insulators or nanomachines need a thorough understanding of the behavior of the material down to the molecular level. Thermodynamics, which have been developed two hundred years ago to increase the efficiency of steam engines, typically observes and averages over a large number of molecules. Now a team of scientists has developed a methodology, to investigate the equilibrium thermodynamics of single molecules. 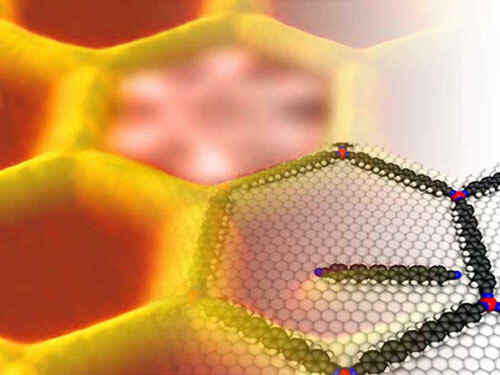 Now researchers from Technische Universität München (TUM) and Linköping University (LIU) have developed a methodology, which allows to explore equilibrium thermodynamics of single molecules with atomic resolution at appreciable temperatures. The breakthrough study ("Visualization and thermodynamic encoding of single-molecule partition function projections") is based on two pillars: a technology which allows to cage molecules within two-dimensional nanopores and extensive computational modelling.